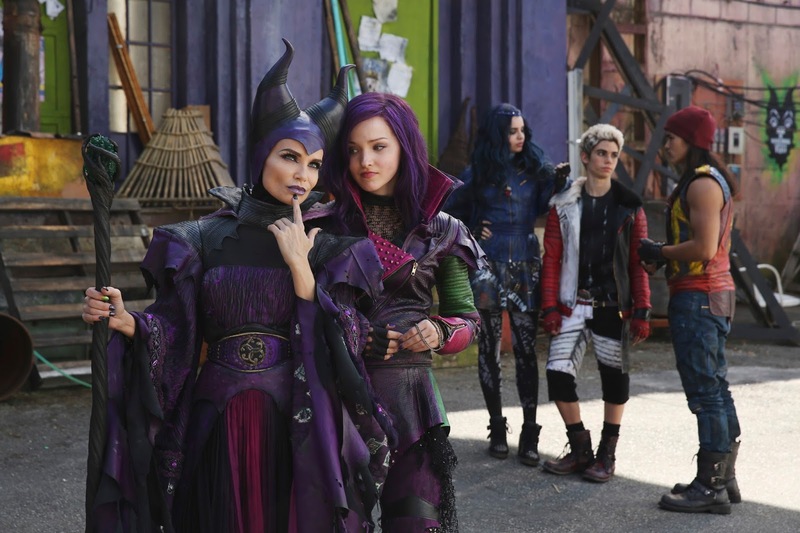 With a knowing wink at traditional fairy tales, Disney's "Descendants" fuses castles with classrooms to create a contemporary, music-driven story about the challenges adolescent offspring face in living up to parental and peer expectations. With unexpected characterization, plot twists and turns, and dashes of wry humor, the movie is designed to appeal to kids and grownups alike as its story playfully presents the possibilities of what happened after the "happily ever after." 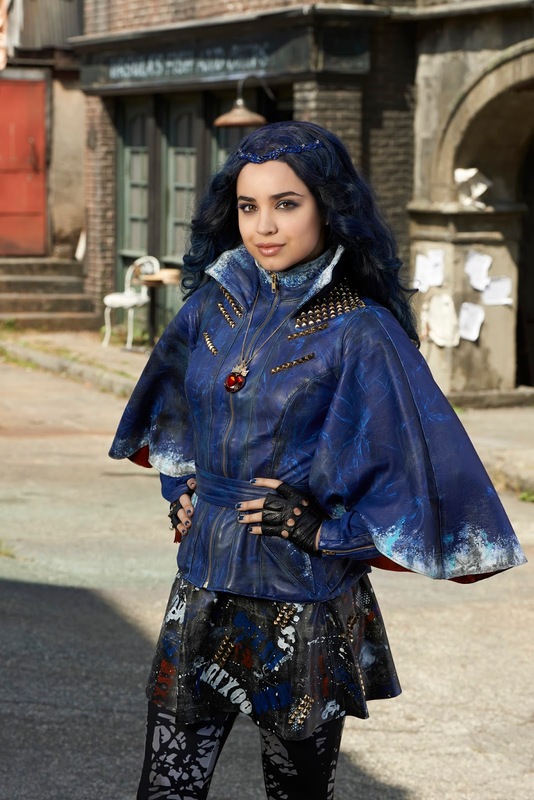 An imaginative new spin on the universal theme of conflict between good and evil, the Disney Channel Original Movie introduces the adolescent offspring of classic villains and as these sons and daughters of evil meet the children of goodness, their story incorporates empowering themes about self-confidence, finding the beauty within, freedom of choice, personal responsibility, teamwork, justice and empathy. 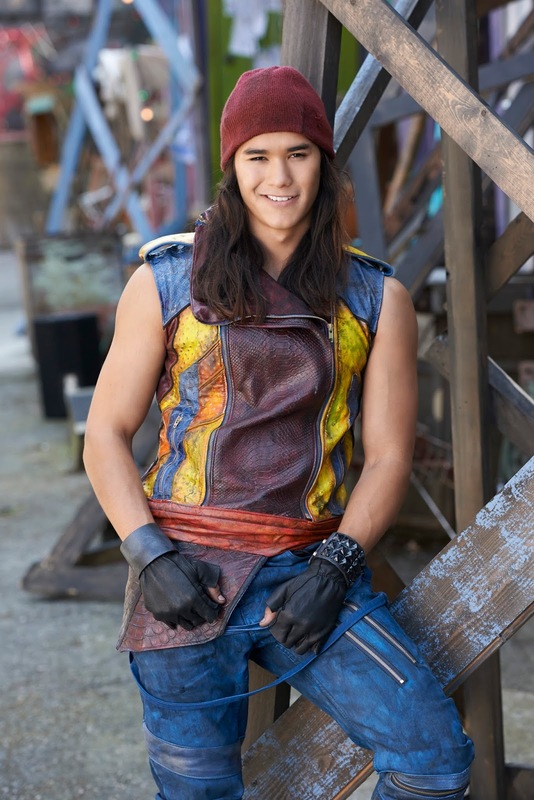 In the idyllic kingdom of Auradon, Prince Ben, the benevolent teenaged son of the King and Queen (Beast and Belle from "Beauty and the Beast") is poised to take the throne. His first proclamation: offer a chance at redemption to Mal, Evie, Carlos and Jay, the trouble-making offspring of Maleficent, the Evil Queen, Cruella de Vil and Jafar who have been imprisoned on the forbidden Isle of the Lost for 20 years. 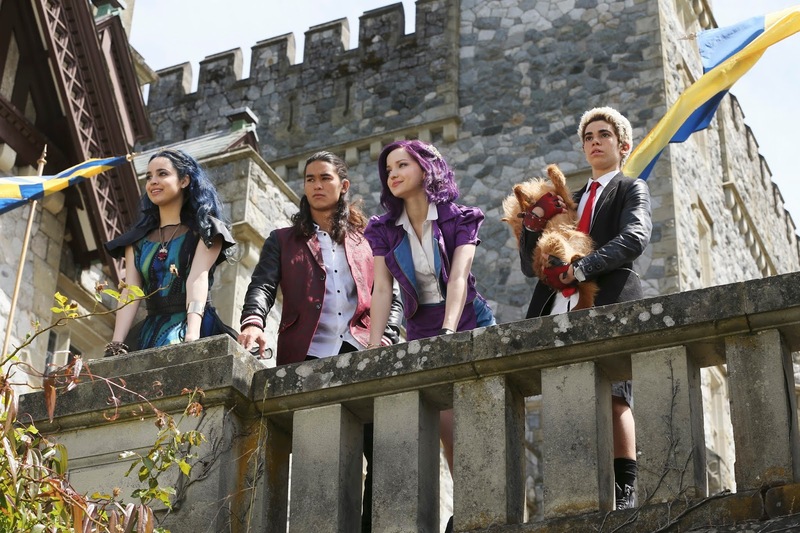 These villainous descendants are allowed into Auradon for the first time to attend prep school alongside the teenage progeny of Fairy Godmother, Cinderella, Sleeping Beauty and Mulan. 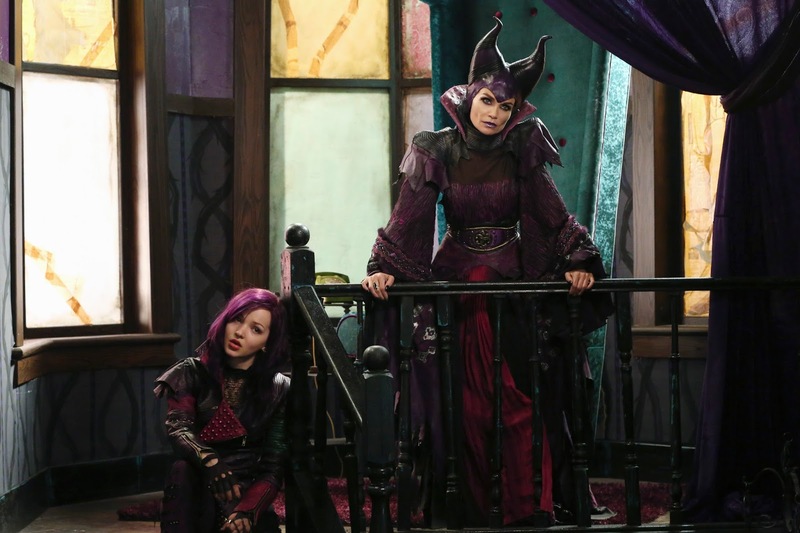 Only time will tell if these evil teens will follow in the footsteps of their wicked parents! 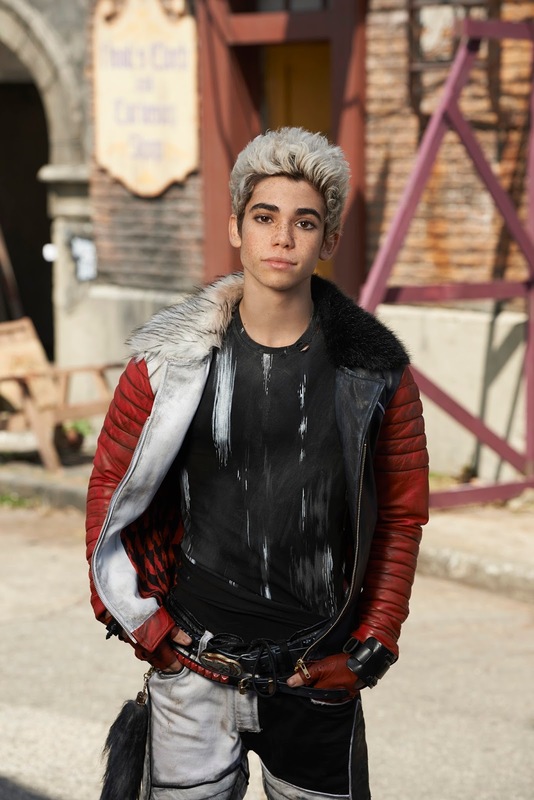 Conjuring the production design and the location sets to bring to life two very different worlds -- the desolate Isle of the Lost and pristine fairytale land of Auradon -- was like being on a creative playground for production designer Mark Hofeling ("Teen Beach Movie," "High School Musical"). "Creating worlds that don't exist is an amazing challenge, conceptually and creatively. There was very little we didn't build from scratch or dramatically transform." Hofeling and director Kenny Ortega envisioned the Isle of the Lost as a slum, with a disempowered Maleficent reigning from her "cold-water walk-up above the Bargain Castle" overlooking a street filled with potholes and graffitti. Explains Hofeling, "The Isle of the Lost is a wreck because the villains who were banished there don't know how to fix anything. All they do is barter and steal. We visualized them stuck in the 1970s, in a pre-digital world that was tragic, but still darkly majestic." No twittering birds, and absolutely no tweeting. Hofeling says that, while "it was fun to imagine a world without evil or bad guys," a perfect world does have its drawbacks. A land full of castles, croquet and chocolate chip cookies, Hofeling adds, "Auradon is a bit two-dimensional. It's beautiful, it's wonderful, no one ever gets a cavity … but there's no edge. It's a goody two shoes, too-perfect sort of place." Costume designer Kara Saun ("Project Runway," "America's Best Dance Crew") was thrilled to design the edgy looks and what she calls "dirty candy" colors of the Isle of the Lost, as well as the cotton-candy royal elegance of Auradon. She said of her work on the project, "Every costume designer prays for a project where you can just go crazy. I'd been looking do something fun, fresh and whimsical, and two pages into the 'Descendants' script I said, 'I have to do this!' There were so many characters with wardrobes ranging from iconic punk looks to red carpet couture—both of which happen to be my specialty! It was so much fun for me to go from one world to the next. " The two distinct worlds required over 1000 costumes, every look created by Kara Saun and her team. Kara Saun individualized each signature character's wardrobe with a symbol that personified them and evolved their looks and colors as their characters progress throughout the story. 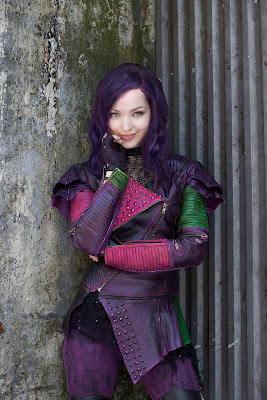 Befitting Mal's lineage and hard exterior, she dons a dragon-themed wardrobe of dark purple, magenta and poisonous green. Evie, the aspiring princess and daughter of the Evil Queen, is decked out in crowns and hearts, with hues of blue and black. Tough guy Jay was all about cobras and leather, from the graphic snake on his jacket to his faux snakeskin boots. Carlos was decked out in dog emblems in the black, white and red palette of Cruella de Vil. The contemporary, hook-filled music includes six original songs ranging from edgy electronic dance music (EDM) to a beautiful ballad and an urban pop rendition of "Be Our Guest" (from "Beauty and the Beast"). 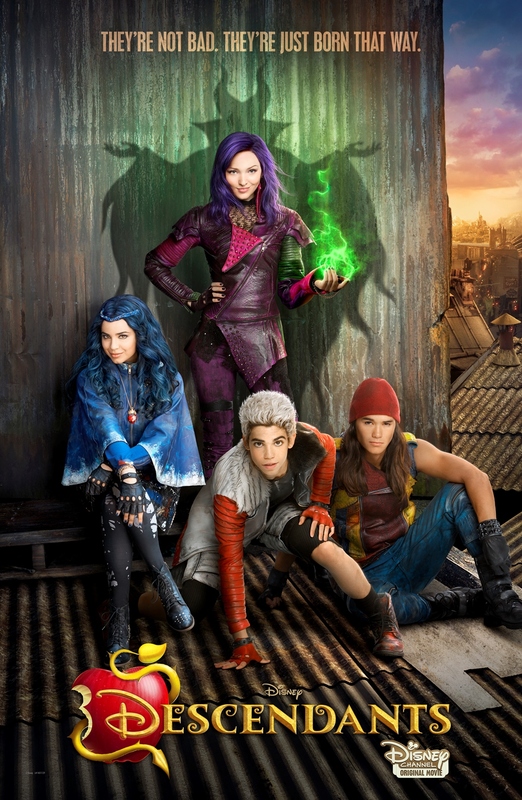 Steve Vincent, Vice President, Music and Soundtracks, says that "Descendants" opening dance number "Rotten to the Core" was darker than Disney Channel had gone before, but a purposeful choice that set the stage at the very beginning that these were new characters that had a lot of edge." "Evil Like Me" performed by Kristin Chenoweth and Dove Cameron was remarkably written and recorded all within one week. "We wanted a musical show-stopper moment for Kristin that matched a madcap fantasy sequence with a dark edge" in which she cajoles her daughter Mal into following her nefarious footsteps. Tony-nominated Andrew Lippa, who wrote the music and lyrics to Broadway hits including "The Addams Family" and "Big Fish," was given the reigns. Kristin knocked out the recording in just a couple hours and Vincent says of her performance, "She was so gleeful about being bad." The composer is David Lawrence ("High School Musical"). Songwriters and music producers include: Alan Menken, Howard Ashman, Andrew Lippa, Adam Anders, Adam Schlesinger, Johan Alkenas, Peer Astrom, Charity Daw, Josh Edmondson, Nikki Hassman, Sam Hollander, Craig Lashley, Marco Mariangelli, Grant Michaels, Shelly Peiken and Joacim Persson.